Just after sunrise this morning I visited the area where monarchs were gathering late yesterday afternoon. I couldn't find any monarchs here. 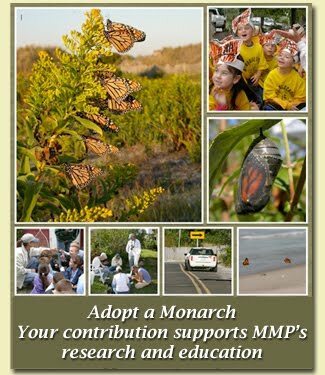 On several other occasions we have watched monarchs gathering in one spot late in the day and then shifting to another location for the overnight roost. This may have happened last night, we just don't know. About ½ hour after sunrise I started seeing a good number of monarchs in flight, mostly drifting over the dunes at Cape May Point. I wish I could tell you what the monarchs will do today, whether we'll see many or just a few, but there's no way to predict. Our team will be out there again, counting and tagging, and we'll let you know what we find.